Offer several bluebirds their own roost with the Stokes Bluebird House Package with Poles. The specific and thoughtful features of these homes cater to bluebirds, while the included accessories make this a perfect way to care for these birds. A 1.5" diameter entry on the front of each home provides birds access to the shelter, and a 0.75" thick predator guard around the entry keeps it from being enlarged by woodpeckers. A steeply slanted, lapped roof overhangs each entry, directing rain away from the nests, and a slot on the floor of each helps any captured water drain. Place an included Songbird Essentials Bluebird Nest Lift and Blowfly Screen inside each roost, helping the birds remain safe from nest parasites. Corner gaps on the homes help regulate the internal temperature, as does the 0.75" thick, natural wood construction. The front panel swings upward for nest checks or end of season maintenance, and remains closed thanks to a metal latch. 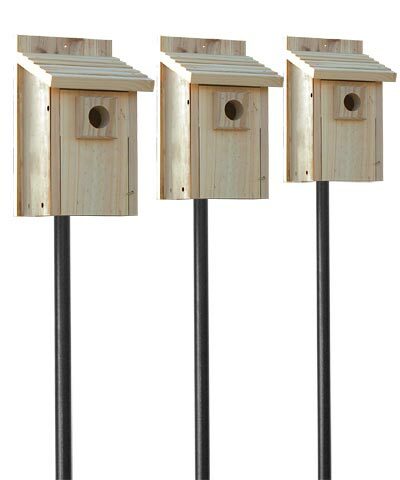 Attach the included bluebird house adapters to the back or base of the homes, and display these roosts on the included Erva Deluxe Birding Poles. The robust construction, bluebird-specific details, and traditional shape make these abodes some of the best available, and will certainly serve your bluebirds faithfully for many seasons. Start a lasting bluebird trail using this Bluebird House Package with Poles.